The Sentinel. Kenai Peninsula. Alaska. 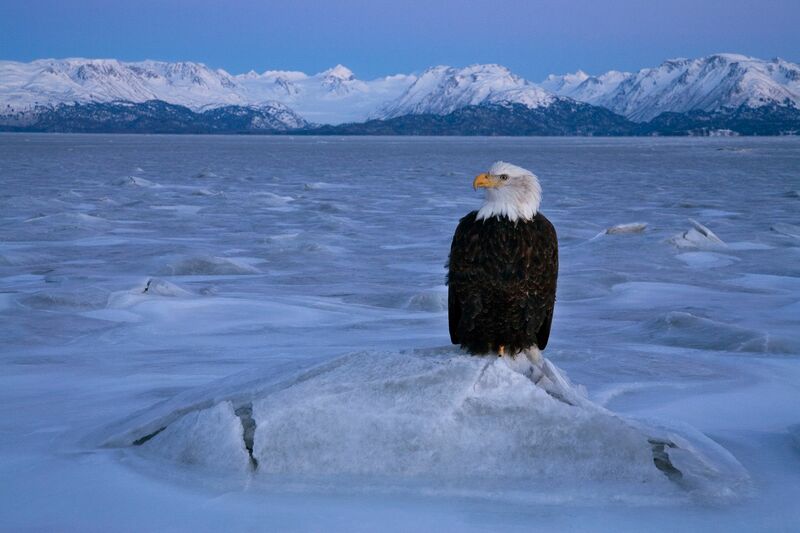 A bald eagle perched at dusk on upthrust ice in Alaska's Kenai Peninsula. Snow Patrol. Mississippi River. Ilinois. 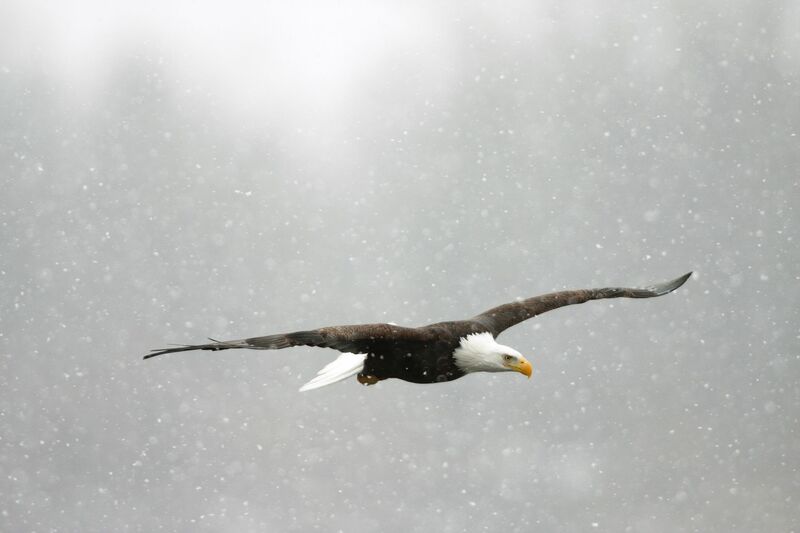 An adult bald eagle scans the Mississippi River in Illinois for fish during a January snowstorm. The Acrobat. Kenai Peninsula. Alaska. 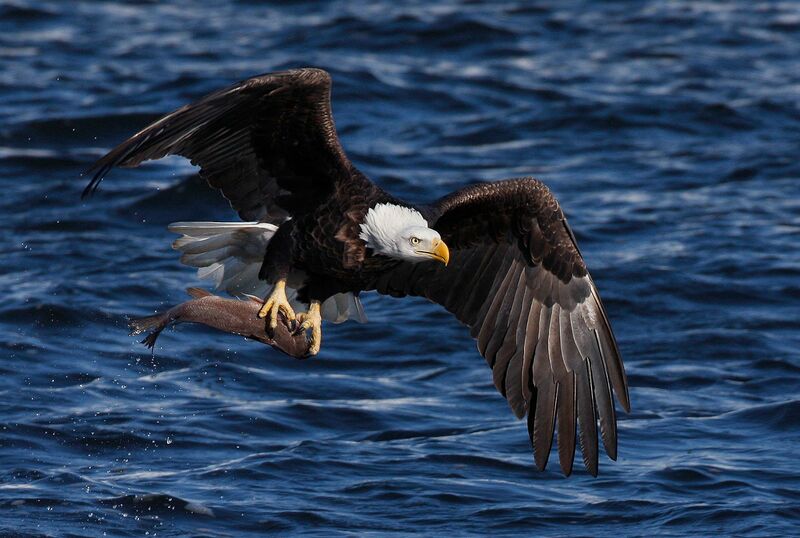 Bald Eagle with perch. Mississippi River. Iowa. Ice Landing. Kenai Peninsula. Alaska. 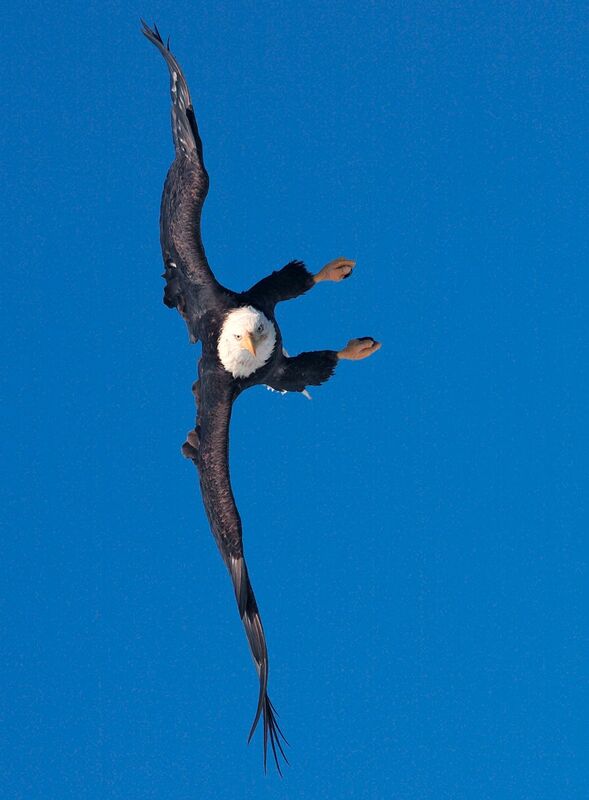 Bald Eagle above Mississippi River. Iowa. 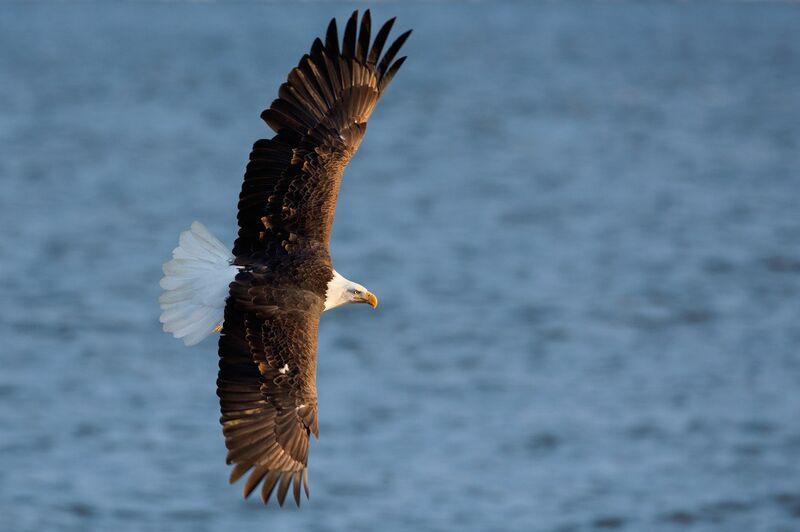 Late light shines on a mature bald eagle hunting above the Mississippi River in Iowa. Sacred Forest. 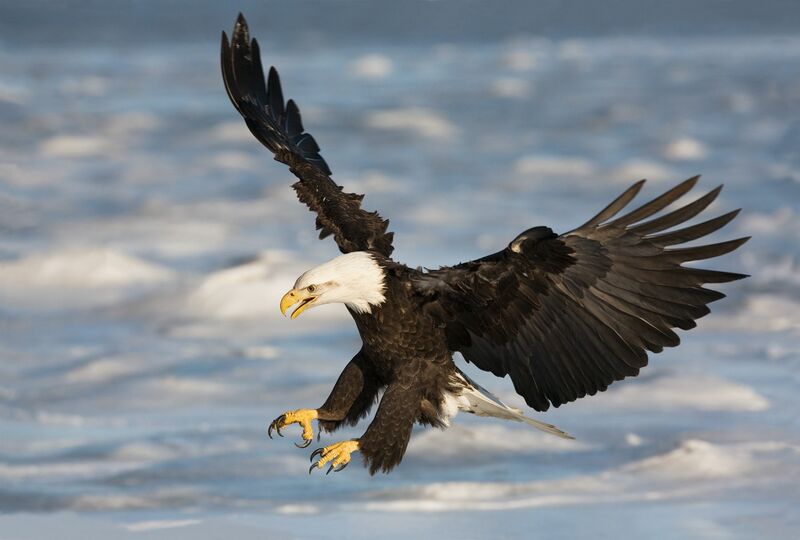 Bald Eagles along Mississippi River. Iowa. Bald eagles gathered to roost along the Mississippi River in Iowa. A male osprey brings a fish to his mate at their nest on an Indiana lake. Osprey returning to nest. Indiana. A male wood duck swims among autumn reflections on an Ohio pond. Belted Kingfisher diving for trout. Colorado. Sandhill Cranes. Platte River, Nebraska. Sandhill cranes roosting along the Platte River near Kearney, Nebraska. Sandhill Cranes along Platte River. Nebraska. Waves of sandhill cranes come to roost at sunset at Rowe Sanctuary along Nebraska's Platte River. Sandhill cranes at Bosque del Apache National Wildlife Refuge leaving their marshy roost site in early morning light. Sandhill cranes and shovelers. New Mexico. A brilliant sunset illuminates sandhill cranes and shovelers at Bosque del Apache NWR. New Mexico. Adult sandhill crane in flight at Bosque del Apache NWR in New Mexico. Snow geese swarm a field under threatening skies at Bosque del Apache NWR on a December morning. Snow Geese. Bosque del Apache NWR. New Mexico. Sunrise Blastoff. Bosque del Apache NWR. New Mexico. Snow geese take flight at New Mexico's Bosque del Apache NWR. Greater Prairie-Chicken courtship display. Nebraska. At sunrise in early April on a Nebraska tallgrass prairie, a male greater prairie-chicken performs its distinctive courtship dance. Male geater prairie-chicken displaying on lek. Nebraska. Fighting male Greater Prairie-Chickens. Nebraska. Adult male Greater-Prairie Chickens battle for the attention of females on a lek in Nebraska. Male greater prairie-chicken on deer antlers. A red fox pauses amongst spring wildflowers in a forest in suburban Indianapolis, Indiana. Female Luna Moth on Mossy Rock. Indiana. A luna moth rests on a lichen-covered rock in Marion County, Indiana. June. Onboard Dining. Common Loons. Michigan. A Common Loon feeds its baby a crayfish on a lake in northern Michigan. At sunrise, an adult turkey vulture spreads its wings to gather the warmth of the rising sun. Muted Snowstorm. Prophetstown State Park. Indiana. A peregrine falcon patrols its territory over downtown Indianapolis. Golden Eagle. Roaring Fork Valley. Colorado. Female golden eagle with pine branch for nest. Colorado. Long eared owl, hunkered down during an Indiana snowstorm.